Neil Peart hardly could have known how accurate that statement would be. Today the band is approaching its 40th year since its first full-length album. Most artists of their age lucky enough to be still performing spend most of their time coasting on the tails of decades-old hits and playing as shadows of their former glory. Rush seems to continually push itself into new territory creating an ever-changing sound yet with ever constant sensibility. Something about Rush feels contemporary but remains rooted in the sound of three guys from Toronto four decades past. Rock artists worked more quickly back then. By 1976, a banner year for Rush, the band had produced four studio albums. Having resurrected themselves from the brink of extinction (or at least from being dropped by their label) with the inexplicable popularity of their futuristic totalitarian opera “2112,” the band toured extensively throughout the US and Canada. Their “brief” stretch promoting the new album ran from February to August and included opening for Blue Oyster Cult and Aerosmith. Somehow the band found time to put together a double-live album of those recent shows and, with but a week in-between, again headed out on the road from August and into the new year promoting that record, All the World’s a Stage. By the time they wrapped up in England in June of 1977, Rush had been touring for nearly two years without a lengthy break and receiving accolades not only for their recorded work but for the power, skill and intensity they brought to the stage. Their non-stop efforts paid off in numerous ways. First, their newly found success provided them with the unusual luxury of a full-month plus to write and record. Previous creative stretches were limited to a week or two in-between touring and meant that recording sessions were always under a time crunch. The five weeks they took to record this time around must have seemed an opulence in comparison. Second, having honed their chops as individuals and as a band, not to mention daily refining the tightness that much of their then-current material required, they were at a peak and wanting to challenge themselves as musicians and songwriters. Listening to more progressive rock themselves at the time, they were interested in the freedom to really explore the possibilities it offered them as a group. Third, winding down a world tour in England gave them an opportunity to work outside the familiar surroundings of Toronto, perhaps removing the sense of business as usual in the studio. Thus their new recording session of what would eventually become A Farewell to Kings began its life as something quite distinct from its predecessors. The band brought in new instruments and new influences. From its opening chords it is clear that they weren’t interested in writing “The Priests of Syrinx Return.” One can hardly imagine a more contrasting image to the tyrannists-as-wall-of-sound conclusion of 2112 than a lute-styled classical guitar playing to the background of chirping wrens and gentle bells. Such stylings reflect some of the band’s primary influences of the time, like early Yes and Genesis. 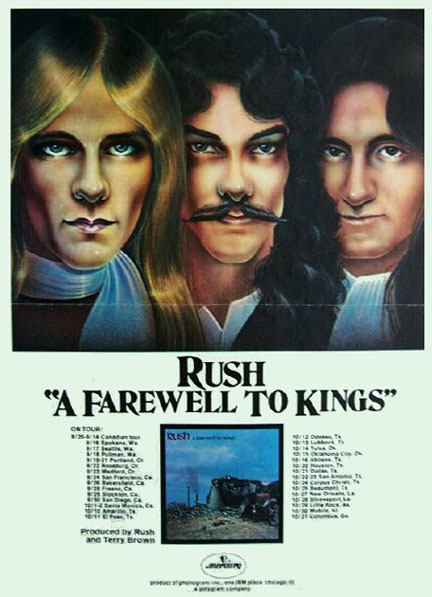 But if you compare it to Rush’s previous album openers, in fact if you compare it to any of their other albums before or since, A Farewell to Kings stands alone with its gentle intro. What possibly could have possessed them? In many ways A Farewell to Kings remains one of their most adventurous recordings. The quiet of the intro lasts but a minute. Yet even with the entrance of the full ensemble the sound isn’t overbearing. Alex Lifeson’s guitar chords are fairly clean—the bright and edgy sound that would dominate his playing through the next decade and beyond; the rhythm is less driven and with more space. Clearly there are moments that pull in the listener towards an intimacy unique in the band’s catalogue. Geddy Lee’s playing is more melodic and active in one sense and more harmonically varied at the same time. His vocals, though never particularly subtle, convey the reflective tone of the words as he enters — less angry and more hopeful than on 2112. If listeners had missed it in Neil Peart’s epic story lines past, here he again was openly pondering big questions. Yet this time the “Them against me” of 2112 had become a reflection about “us”: Are we really headed to a place we want to go to? Is it possible to recover or perhaps newly discover a truer time? Oh, can’t we learn to feel what’s right and what’s wrong? The title track “A Farewell to Kings” seemed more than any previous lyrics to be like a journal entry—not really looking back nostalgically nor overly idealistic about possibilities but seriously questioning what might be. It was a new space for Peart’s writing. As they stretched their strengths musically the band also became more willing to create now and worry about how to play it live later. The additional instruments, the keyboards percussion and particularly the layered guitars helped to give the band’s sound a more complex texture. The power trio is still there but it covers a more generous sonic spectrum. Consequently even the hard sections don’t overpower the ears. Lifeson’s indulgence in chorus and flanger effects softens the blow of his Marshall stack as he begins to really craft his own style. Besides dusting off his old classical Lifeson also introduced some new guitars to his arsenal. His beautiful Gibson ES 355 makes it’s debut on the album. And the many guitar changes required to play these songs live commenced the era of the double-neck electrics for both guitarist and bassist—a custom Gibson SG model pairing a six-string and a twelve-string guitar for Lifeson and a custom Rickenbacker 4001 pairing a standard guitar with a bass for Lee. The dueling “duallies” became a standard poster shot from their stage performances. The additional instruments feature prominently on perhaps the strongest track of A Farewell to Kings, the Samuel Coleridge-inspired “Xanadu.” The expansive piece would become a staple of their shows for the next five years and remains a live-audience favorite. The piece opens with an evocative instrumental—low bass-pedal synth foundation adorned with guitar swell melody, wood block taps and wind chimes—recalling an early fog-covered morning. It’s an incredibly cinematic image including a beautiful touch to setting the scene with the Moog wind sounds and the orchestra bells fading in a de-tuning decay (with a spacious panning from the right and exiting stage left). The anticipation mounts as Lifeson begins his beautiful electric guitar ostinato in the distance. The brilliance of Lifeson’s simple opening musical phrase should not be overlooked, so permit me to indulge in a bit of theory here. The uninitiated listener accustomed to the typical rock ‘n’ roll backbeat in common time (4/4) often comments that progressive rock music has “lots of weird time-signatures.” While this is true, what makes Rush’s music (and that of many other great prog bands) work so well is that there is a rhythmic complexity within common time on the one hand and a foot-tapping beat that grounds their use of “uncommon” time on the other. Most listeners would be surprised to find that many songs that sound like they are in a strange time signature are actually just complex rhythms over common time (give a listen to The Police’s “Spirits in the Material World”). Conversely some of the most powerfully contagious songs are in “odd” time signatures (to wit, Pink Floyd’s “Money,” Genesis’s “Turn It On Again,” and of course Rush’s “Subdivisions”). Lifeson’s first distant and then explosive phrase opening “Xanadu” is actually a pair of identical seven-note phrases. In the first pass the accents are on notes 1, 3, 5, 7. But since there is an even pulse underneath the phrase the second set of the same notes end up accented on beats 2, 4, 6 which then allows the accenting to start over smoothly. And so the count is seven?…I mean it’s fourteen, wait…no it’s 4 + 3. None of this analysis really matters since the listener isn’t usually counting or reading a score. But the overall effect produces a sensation which scientists should call “psychic oscillation.” There are moments in listening to some music when the power of the sound is so well prepared and so beautifully crafted and balanced that it literally seems like it couldn’t be too loud. The body feels physically thrust into the sound. Beethoven’s 9th ends with such a moment. This is another one. Lee and Peart wisely give space and simply provide rhythmic support to Lifeson’s glittering guitar. As the full band joins in, producer Terry Brown adds to the intensity of the effect by creating a stark contrast in the emphasis of frequencies between the tones and reverb in the distant section and the close-up sound of the full band when it enters. It is perhaps the only moment in the song where I think the power of the studio version to be stronger than their live recording from Exit…Stage Left. Its strength and energy beautifully sets the scene for the mythical world of the classic poem. Peart’s lyric conveys the mysterious imagery of Coleridge’s original but he flips the perspective of the narration from observer to participant. As with the opening track, the theme of “Xanadu” is reflective: Would an earthly paradise of human origin really be a place of pleasure? Peart’s answer: When mankind tries to create a paradise on earth we instead find we have fashioned a prison—a theme that weaves well into the larger scope of the album. Remarkably the music of Lee and Lifeson convincingly renders this vision in sound. The glittering paradise, the sensual exclamations of the opening become the strained cries and tortured lead lines of the conclusion. “Xanadu” also begins Lifeson’s discovery of the suspended chord. Though he jokingly claims to have invented it, a similar technique can be found on Steve Howe’s part in two different sections of “Starship Trooper” (and loads of flamenco music, et al). But Lifeson uses the suspended chord to an extent and in a fashion that was unique. The upper two strings on the guitar ring open throughout most of his guitar track serving as a sort of drone for seven different chords. As the chords move around the tones, they sustain as a chime in the wind shifting into dissonances and consonances while remaining constant. Paired with the lyric, it is part of what forms the other-worldly perception of the song. These chords would become an essential part of Lifeson’s signature style and in a certain sense form a musical likeness of Peart’s philosophical musings. Musically speaking what works so well on Xanadu is what works for the best of the Rush oeuvre. Each section of the piece remains distinct, yet fluently integrates into the larger structure. On this count Rush actually surpasses their influences such as Yes and even Genesis in their ability to take disparate elements and join them in such a convincing and natural way. In part they accomplish this through a strong sense of pulse—a clear rhythm which underlies every section. The deliberate uses of silence and breaks allow radically differing beats and counts to be united with Peart’s and Lee’s fills often providing the smooth shift into new territory. But unquestionably the band’s unity as musical force is the deciding factor. Other progressive bands were often “super groups” with ever-shifting—albeit highly skilled—personnel, sometimes recording at different times and occasionally in different places. One experiences Rush as a singular creative unit. Rather than competing, their parts always seem to complement. Though they strove diligently to achieve their artistry individually, the unspoken impulse, the instinctive groove, the moment of held breath all reveal themselves in the act of performance of three men working as one. Kevin: Fabulous piece! I especially appreciate it as a non-musician for whom theory and notes and chords are a mystery. Thank you! Terrific piece, Kevin – shedding some new light on one of my favourite albums. Wonderful analysis, Kevin. Xanadu is my favorite Rush song and one of my favorite rock songs, period, so it’s a subject dear to my heart. Your thoughtful essay does justice to the music. I look forward to the next installment. One correction. Alex’ guitar that made it’s debut on AFTK is an Alpine white Gibson ES-355, not 335.. Thank you for the clarification Greg. Yes, I believe the 355 was the cadillac version of the 335. It has that cool varitone knob on it–I’ve always wondered how that altered the tone. Great analysis Kevin. Its funny how you were able to articulate my feelings as a 12 yr old when I first heard (and bought) this album. Well some of them anyway. Xanadu is to this day my favorite Rush song although I love many more. Nothing Rush has done before or since can match the grace, style and emersiveness of Xanadu. Well done! Great piece – I had never looked at Xanadu thematically as you discussed here. It’s great to get a new perspective. I’ve actually always preferred the live version from ‘Exit … Stage Left’ over the studio version, partly because I like the pacing of the live version better, but also due to a certain ‘dryness’ in the production of the studio version (I have a similar feeling about a couple of live versions of Yes’s ‘the Gates of Delerium’ relative to the studio version of the same, if that helps clarify what I mean). Either way though, it’s a great piece of music and a great album overall. Agreed on the live version. It’s more relaxed in the right places and overall it’s superior. But the punch of Alex’s melody as he shifts into the loud section is more powerful with Terry Brown working his magic in the studio and I miss it when I listen to the ESL version. 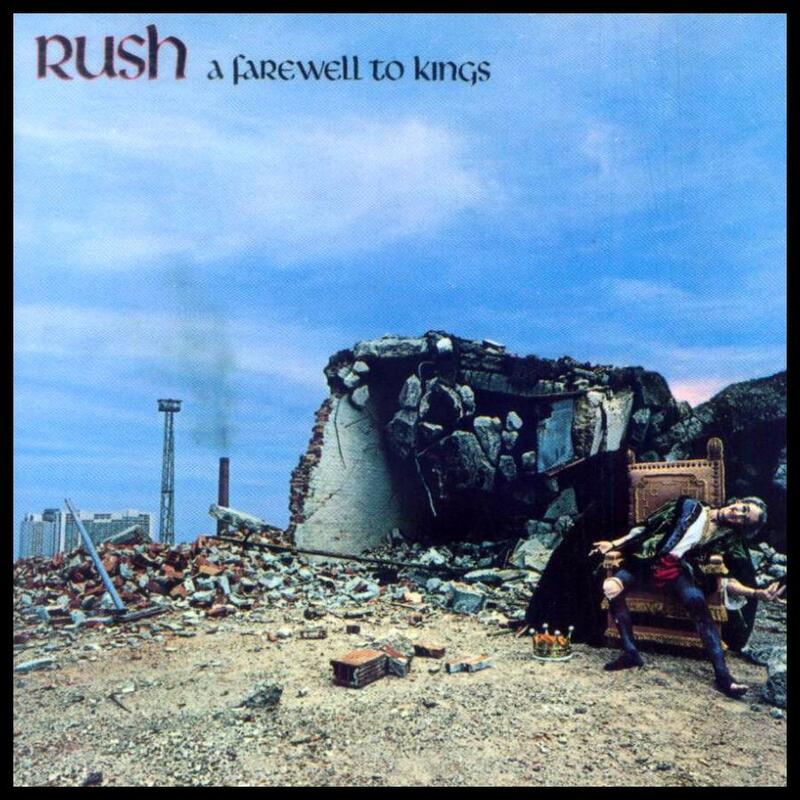 Kevin, I am not a Rush fan, unlike many ‘Progarchists’, but i have this album on vinyl, bought in my youth. A deeply intelligent perspective and you have helped me to stop getting irritated by not recognising unusual time signatures. I can now rest easy that they may well be just ‘complex rhythms over common time’ !! So I’m going to give the album a spin now….maybe I can be converted…thanks. Great piece. Especially impressed with the detailed look at Alex’s Xanadu intro and its use of rhythm. Excellent look from the inside out at Xanadu…. as a guitarist who can play it I must say you’ve pointed out new angles to me that I cant wait to get home & explore. In the repeating intro lick I always thought from listening (before I learned how to play it) that it must be different notes in the 1st/3rd times vs the 2nd/4th…when I first learned it I realized the notes were same but thought somehow the rhythm was different…now I realize its the different accents you mention due to the even pulse beneath. This song truly takes you to a far-away place and then brings you back again. This & La Villa Strangiato are 2 of Rush’s best masterpieces. Great article. Can you write one now on La Villa Strangiato please ?!?!?! ?